You are currently browsing articles tagged anemone. 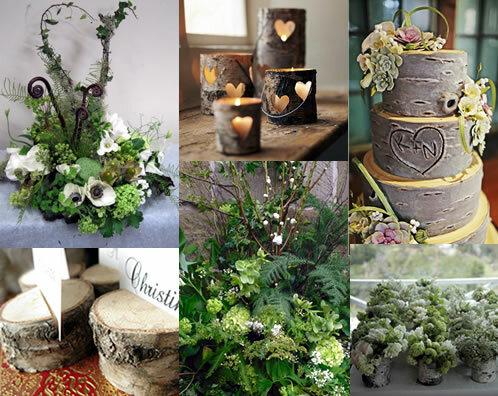 Woodland themes have been very popular since Breaking Dawn was released last year featuring a magical woodland wedding. Outdoor weddings may not be possible in our unpredictable British climate, but you can certainly bring the great outdoors into your venue with your flowers and décor. For this woodland inspiration I’ve focussed on using birch and bark to make your decorations, mixed with flowers in a classic white and green palette. Birch can be used in a variety of ways to enhance the woodland feel of wedding décor. The thin bark strips can be used in flower arrangements or wrapped round glass jars to make log vases. Birch logs can be cut into sections and used to hold place name cards, or hollowed out to hold tea lights. White flowers work beautifully in a woodland theme, arranged with natural foliage to appear as though they are growing. Ferns, moss, lichen covered branches and bark help add to a natural look. The table arrangement in the mood board looks like a patch from a forest has been scooped up and placed on the table. It’s got all-sorts of interesting foliage in it like maidenhair fern, lotus seed heads and ivy. 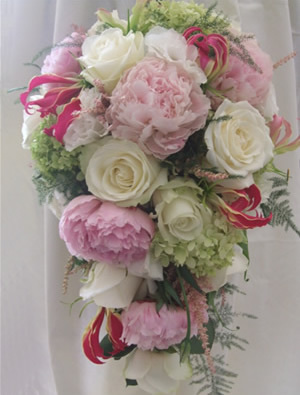 The flowers used are anemones, sweet peas, freesia and viburnum. 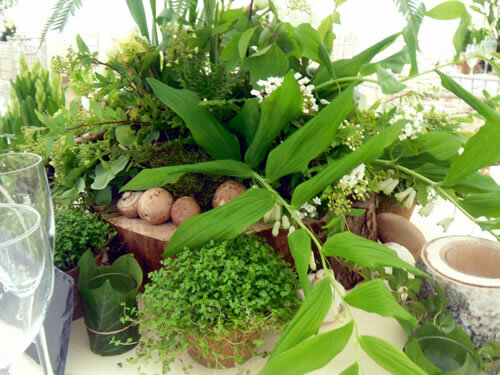 Small plants wrapped in birch bark can be placed around your centrepiece, anything like ivy or ferns. To continue the natural look wrap tea light holders in ivy leaves and secure with raffia. The flower arrangements can contain natural elements that you can collect from your nearby woods such as acorns, pine cones and fallen branches like larch. 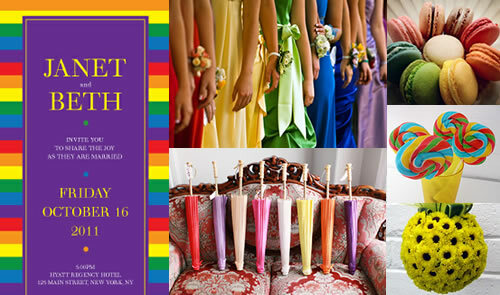 Todays wedding inspiration is based on happy and cheerful rainbow colours. Apart from being a really fun colour scheme it can solve a few problems, if can’t decide on just one colour, have seven. If your Bridesmaids can’t agree on which colour they all like and will wear, give them seven colours to choose from. This is the perfect theme for anyone who feels restricted by traditional colour schemes of one or two colours. If you are on a tight budget your bridesmaids don’t even need to have matching dresses for this theme, as long as they pick dresses in rainbow colours. For flowers there are a couple of options to suit rainbow schemes. 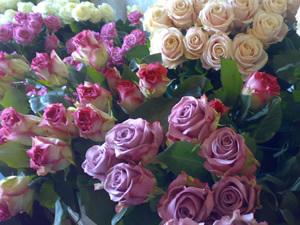 Firstly you could have a different colour bouquet for each bridesmaid to tone with their dress. Or you could have all the bouquets the same, just pick flowers in various shades of the rainbow. To make the second option effective, I would have compact hand tied bouquets using flowers like roses, dahlias and gerberas to give blocks of colour. Small delicate flowers won’t have much impact in this colour scheme. Alternatively for outdoor weddings your maids could carry brightly coloured parasols instead of a bouquet to match their dress. To carry the theme through for the gents, the men could all wear a different colour tie or cravat in a rainbow colour with matching buttonhole. For venue flowers pick designs that are simple and modern to suit the rainbow theme. Try a cluster of small glass vases on the tables with different colour arrangement in each vase. There are plenty of opportunities to incorporate the rainbow theme on your reception tables. Each place name could be in a different rainbow colour, you could give guests mini rainbow swirly lollipops as favours, or little bags of sweets in rainbow paper bags. To keep kids entertained give them packs with colouring books and rainbow crayons. This fabulous cake is probably more suited to a small wedding party as it would be a nightmare to cut into lots of pieces. 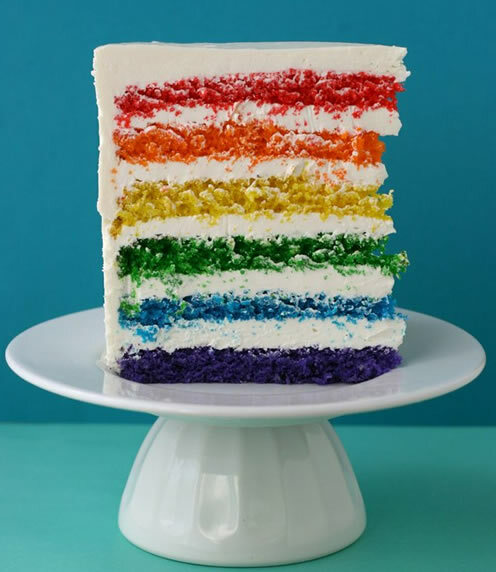 But I love the idea of it appearing to be a simple white cake and then revealed as an amazing multi-coloured masterpiece. A simple cake iced in white would look stunning dressed with fresh flowers in rainbow colours, or you could have a white cake iced with tiny rainbow polka dots. If you want full on rainbow for your cake, cupcakes might be a better option with rainbow buttercream topping. Pronounced a-nem-o-nee, the name comes from the Greek word “anemos”, which means wind. 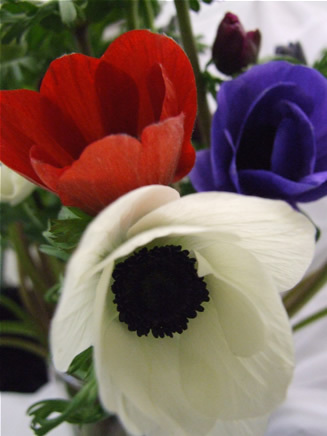 Growers have cultivated outsize Anemones in recent years, which are perfect for displaying in vases singly. Although their vibrant colours look equally good arranged en masse. The Anemone symbolized the death of Adonis in Greek Mythology. It is said Aphrodite used the blood-red Anemone to preserve his memory. This is the origin of ‘Adonis gardens’, clay pots filled with Anemones. 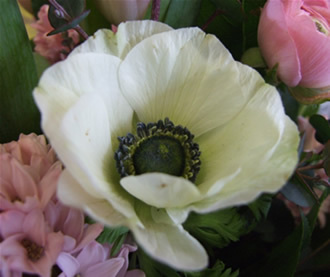 Anemones are perennial herbs from the Ranunculaceae or buttercup family. They are mainly available from September to May, and are now grown throughout Europe, They don’t like to be out of water and are quite thirsty drinkers when in a vase. Anemones continue to grow after being cut from the bulbs. Their delicate, paper like blooms are exquisite in spring bouquets, in their pale shade of lillacy/white or vibrant blues and red. 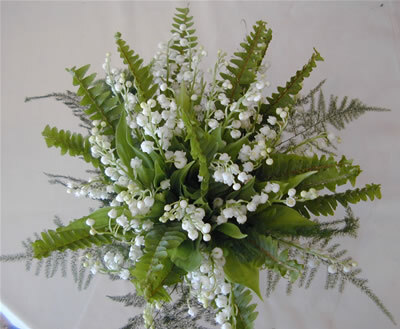 They are also popular in winter bridal bouquets. We are a nation that loves our mothers. Thousands of us choose to thank our mums with pretty gifts of flowers or plants. Mother’s Day is one of the busiest weeks of the year for florists and despite the economic uncertainties, this year was no different. 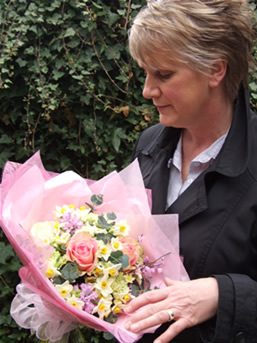 Florists reported a very busy weekend sending beautiful bouquets to mums all over the UK. Weeks before most people have realised Mother’s Day is coming the florist’s preparations start. Suppliers require the order for fresh flowers weeks before Mother’s Day, so this means predicting what customers will want and how much they are likely to buy normally weeks before customers place any orders. In the week running up to Mother’s Day there are a few long days and late nights required to get all the flowers in water and organised, so they can be made into gorgeous gifts in time for Mother’s Day. 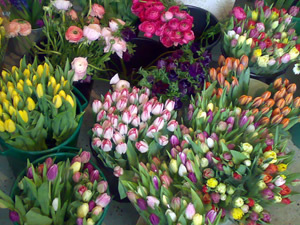 Bouquets of spring flowers were very popular this year. 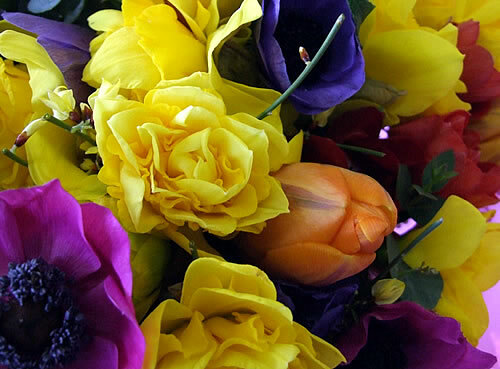 These pretty bouquets include things like hyacinths, tulips, ranunculus and British narcissi. The hyacinths and narcissi make them smell gorgeous. Giant vintage teacups were also popular this year over-flowing with spring flowers …..and there were happy mums all round. Don’t forget a mother is for life, not just Mother’s Day.